Contains every element the human body requires! Amino acids; minerals and trace elements. Additional potencies of vitamins; tissue salts; essential pigment. Every Nutritionist knows how important vitamins and minerals are to our health, and they also know our bodies need many other nutrients to absorb and utilize them. These other nutrients include trace elements, amino acids, cell salts, enzymes, and many others. Since they are all as hard to find in modern foods as the vitamins and minerals they support, any well designed supplement must include them. We are so pleased to introduce the first supplement that does. By providing not only Mega potent vitamins and minerals, but also every co-nutrient we need to use them, a multiple is finally born that can deliver the benefits only complete nutrition can. Because it’s super food/herbal base provides a nearly perfect blend of every nutrient the body requires, the vitamins and minerals are assured of having every co-nutrient they need. This all adds up to a multiple vitamin that works like no other vitamin, and a difference you can feel! We guarantee it! If you are not completely satisfied, we will refund your entire purchase price! The Body Dynamics Maxzorb Raw Mega Nutritional System contains every element the human body requires. Because of this, all its nutrients are far more assimilable than those found in traditional supplements. 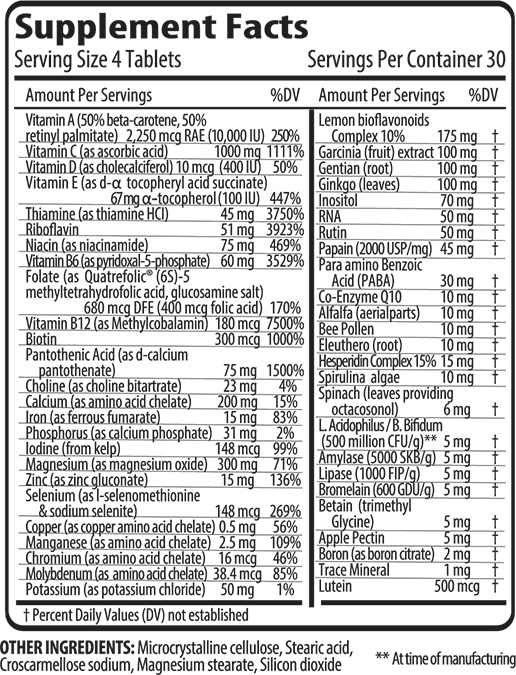 In addition to the nutrients listed more than 100 other nutrients are also present. These are provided through the super food and herbal base that consist of Spiralina, Bee Pollen, Ginseng and Alfalfa. Gentiana is beneficial for the stomach, liver, blood, spleen and circulation. It helps to balance stomach acid (whether too much or too little). It is helpful in cases of exhaustion from chronic health problems and aids weak digestive organs. It strengthens the whole body—it warms and enlivens the system. High in iron, contains B complex vitamins, especially inositol and niacin. Contains Vitamin F, manganese, silicon, sulphur and zinc.